Prototype: Deep well flat car set for Hupac consisting of 2 type Sdgkkmms flat cars. Designed for transporting containers, truck interchangeable load units, or semi-rig trailers. 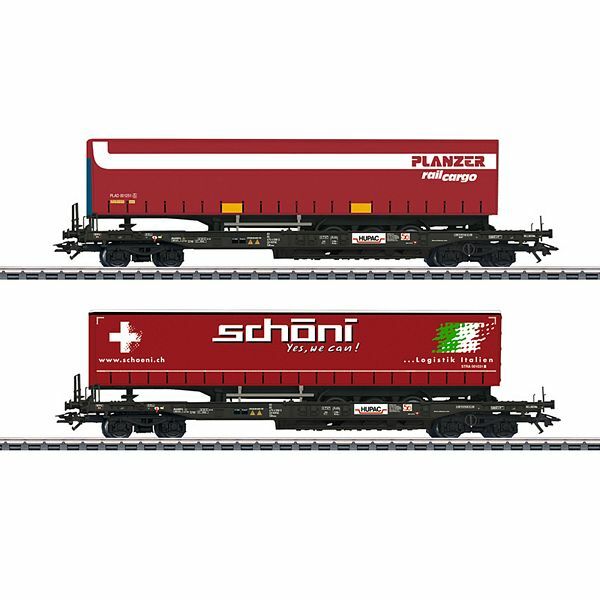 Loaded with semi-rig trailers for the firms Schöni and Planzer. Model: The frames, floors, and load wells on the cars are constructed of metal. The cars have special design low-mounted trucks. The cars have many separately applied details. The load restraints are adjustable. Each car is loaded with a curtain tarp semi-rig trailer. The cars have different car numbers. They are individually packaged. Total length over the buffers 38 cm / 14-15/16". DC wheelset E320577. Cars and trailers each have different car numbers. Märklin close couplers in standard pocket with guide mechanism.